Advanced Card Systems Ltd. (HKGEM: 8210), Asia Pacific's number one supplier of PC-linked smart card readers, today announces that Advanced Card Systems receives D'ucoty's "Product Innovation Award in Telecommunications". 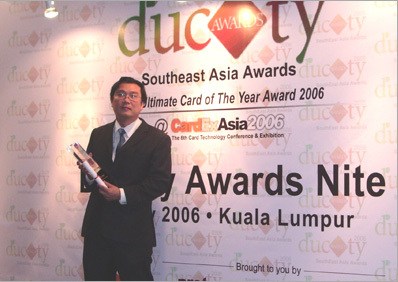 In a ceremony held at CardEx Asia 2006 on 24 Jul 2006 in Kuala Lumpur, Malaysia, Advanced Card Systems was honored with the D'ucoty (The Ultimate Card of The Year Award) "Product Innovation Award in Telecommunications" within the South East Asia region for demonstrating leadership in new product innovation. After receiving the award on behalf of ACS, Executive Director, Mr. Tan Keng Boon, stated, "We are delighted to stand out from our competitors in same industry to receive this prestigious award. This reflects not only the efforts we have made in product design and our research and development, but also the success of our business model and development strategies which have facilitated continuous business growth in the past few years." Mr. Tan further added, "ACS has always kept product innovation our priority and we will continue down that path introducing new and exciting products with high quality and value complimenting our continuous innovation as we meet the ever changing demands of our constantly growing client base now in over eighty countries world wide". Among the latest innovative products to be offered by ACS are the ACR100 SIMFlash and the ACR88 portable smart card reader. More than just a smart card reader, the ACR100 offers 256MB of built-in flash memory and is designed to offer easy access to SIM-sized smart cards (plug-in cards) in addition to data and/or application storage. The ACR88 is a versatile handheld portable smart card reader offering a vast number of advanced features including a built-in keypad, dot-matrix LCD, bi-color LED, audible buzzer and non volatile memory just to name a few. 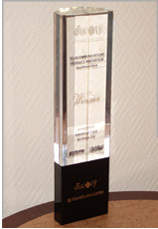 With ACS' amazing 59% turnover growth in 2005 adding to its already strong technology know-how, the company decisively surpassed other candidates to receive this "Product Innovation" award. To capture the tremendous opportunities in the ever expanding global smart card reader market, ACS will continue to drive its business growth by equipping its leading edge products with new and diversified features to address the ongoing needs of both its business partners and customers. ACS will also continue to enhance its sales network, technology know-how and solid business relationships with its partners worldwide. ACS is excited and looks forward to the Group's next stage of growth over the coming year, which will mutually benefit both the company and its diverse customer base alike.